It wasn't a surprise that Liam Hendriks is representing the International League in the 2014 Triple-A All-Star game on Wednesday night at Durham Bulls Athletic Park. In 16 games with the Herd, Hendriks poses a 7-1 record with a 2.19 ERA. The Australian leads the team in strikeouts (74), ERA (2.19), innings pitched (94.1) and quality starts (8). When the International League announced Hendriks the starter on Friday, he was caught off guard. "I was kind of surprised when I found out," Hendriks told reporters. " There's some good guys in this league that have been doing extremely well. I'm honored with the start." 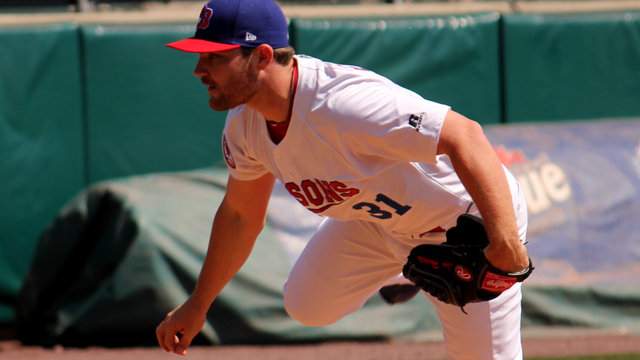 Hendriks is the first Bisons pitcher in 21 years to start for the International league. He joins just four Bisons players that have had that accomplishment. In1990, Dorn Taylor was the first Herd hurler to make an International league start, followed by Rick Reed in 1991 and Roy Smith in 1993. "It's not just a huge accomplishment for me, but for the organization as well," Hendriks said. "I've been throwing well. I mean I've had a couple of rough spots, but for the most part I've been pretty consistent. It's pretty much the aim of the game to go out there, be consistent and do what you need to do,"
Prior to the 2014 season, Liam Hendriks had some trouble finding a home. In the past year he's been on four different ball clubs. In December, the Minnesota twins designated Hendriks for assignment and on December 13th Hendriks became a member of the Chicago Cubs. After Chicago designated him for assignment, he was claimed off waivers again, ten days later by the Baltimore Orioles. After Baltimore designated him for assignment to make room for Ubaldo Jimenez, the Toronto Blue Jays claimed him and placed the righty on the 2014 Bisons roster. "I've got the stuff to be able to succeed up there," Hendriks told reporters about getting some MLB recognition. "It's just a matter of getting it over and not trying to nip pick. From last year, I've had just a little bit of a mindset change in being more aggressive and getting ahead of guys. It's paid off dividends." It's Hendrik's first Triple-A All-Star game appearance, but he does have experience being an all-star in lower leagues. Hendriks was apart of the 2011 Double - A All-Star game, a year where the Minnesota Twins made him its minor league pitcher of the year. The righty was also selected for the futures game twice prior to 2011. "I go about the same way I approach a start in Buffalo," Hendriks said on preparing for his first Triple-A all-star game. "You just have to take this as a normal start. I don't want to change anything, especially when its been working for me. So it's about going out there and getting on the same page with the catcher early." The game will broadcast live on the MLB Network and be carried on the Bisons flagship radio station, ESPN 1520 AM. "I'm interested in seeing the talents of the Pacific Coast League side," Hendriks said. "I haven't faced any of those guys and it'll be an experiment to see what those guys are like, especially with some of the numbers they're putting up as well. "